Got some free time to play with your Xbox One this week? Electronic Arts (EA) has a delightful treat for you. If you have an Xbox Live Gold subscription, the doors to more than a dozen recent EA games are open wide for you to download and play to your heart’s content for free. The benefit week runs from Jan. 19 to Jan. 24. You get zero-cost access to EA Access Vault’s library of games, including Battlefield Hardline, Dragon Age: Inquisition, Plants vs. Zombies Garden Warfare, Need for Speed Rivals and Titanfall. EA Sports Games are in there, too, such as NBA LIVE 15, FIFA 15 and Madden 15. It would have been great to try the most recent versions, but they have not yet been added to the vault; hopefully, the 2015 editions will be enough to scratch your sports gamer’s itch. If you are subscribed to Xbox Live Gold, avail yourself of the free games week by going to the home dashboard on your Xbox One, click on the Gold Member area and download the EA Access Hub App. Any game that you download during the free play week will be the full game, not a mere trial or demo, and your game progress including Gamerscore and earned achievements will be saved and carried over. You won’t need to start over if you sign up for EA Access after the free play days are over. Normally, you’d need to shell out $5 a month (or $30 yearly) to enjoy the games in the EA Access Vault. A subscription lets you enjoy a 10 percent discount on new games and play them a week ahead of the normal release date. 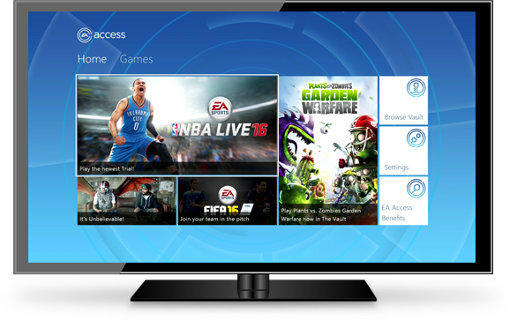 See EA’s announcement about the EA Access Free Play Days to learn more.